Even though it might seem a bit early, it is getting to that time of year when some of our summer birds are starting to head south. Two such birds are the Purple Martin and the Yellow Warbler. Because of variable nesting times, some colonies of Purple Martins will be seen for a while yet, but the ones that nested in our yard are gone already. On the other hand, adult Yellow Warblers are gone leaving behind some juveniles to put on some more weight in order to make the flight south. It is kind of sad to see our summer residents leaving already, but on the bright side the Goldfinches are in the middle of raising their young. Now, to answer last week's question. The two birds on the extreme right and left are Willets; the other three are Marbled Godwits. The Willets have straight and shorter bills; the Godwits have longer and slightly up curved (recursive) bills. The Willet on the left has faint traces of the black and white wing pattern just showing on the lower edge of its wing. In a colour picture the Willets are grey; the Godwits are brownish. One Godwit is partially hidden by the Willet on the left with the upraised wings. With all the water around it is only fitting that I feature a duck in this article. The one I have chosen is the American Widgeon, formerly known as the Baldpate. Why this one? Next to the Mallard, it is probably the most plentiful duck on our sloughs in the fall. As with all ducks, males and females are different. The female looks much like a female Mallard and even quacks like one. The male, with its green eye stripe, resembles a male Green Winged Teal and is often mistaken for one. 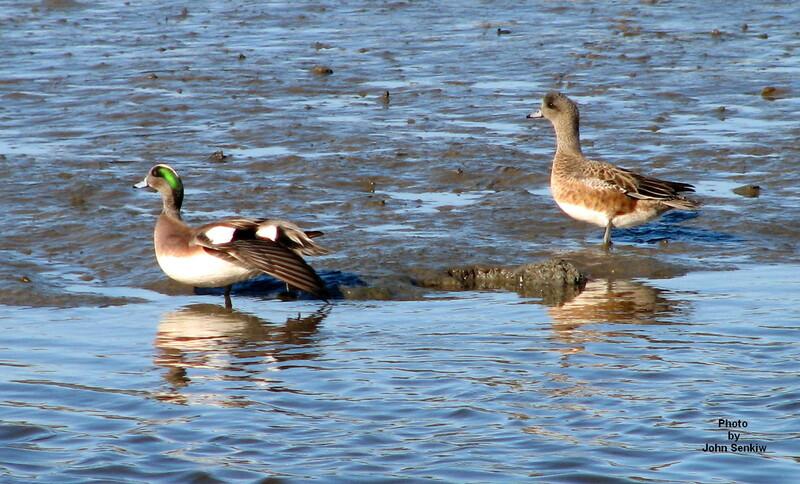 However, the male Widgeon has a greyish head while the male Green Winged Teal has a deep rich brown one. The best field mark by which the male Widgeon can be quite easily identified is the white, sometimes cream, forehead and crown, hence the former name of Baldpate. Both males and females have extensive white wing patches (speculum) and white bellies. To this day hunters often refer to them as white bellies. This week's photo was taken at the Batiquitos Lagoon in Carlsbad, CA. The photo shows a female and a male in the mud at low tide. 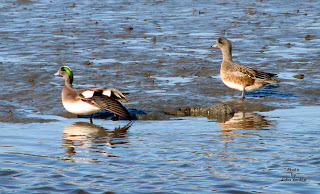 The male is stretching out his one wing showing the white wing patch, and both ducks clearly show their white bellies. In a colour photo the male's green eye stripe is clearly visible. I was recently asked (again) why I take so many pictures of local birds in such far away places. The answer is simple. I take pictures wherever I can get them. Many birds, water birds in particular, are very skittish on their breeding grounds in the summer time. They are very wary of anything that can threaten them and their young. For that reason, as a photographer, I have a difficult time getting good photos of water and shore birds locally, which means the summer time. Generally, I end up taking a hurried shot of a bird rushing for cover. The result is that only a few shots are taken and many of those are out of focus. In California and Texas, just to name a couple of places, the same birds are found in nature preserves where they quickly lose fear of man and can be easily approached up close for extended periods of time. This makes picture taking a breeze. As a result, I have managed to get many excellent pictures of local water and shore birds on their wintering grounds. I hope readers get as much enjoyment of looking at them as I have in taking them.